It is generally accepted that if you want to obtain the lowest possible construction cost, competitive bidding is the answer. When competitive bidding is administered with pre-qualified contractors, the end result is enhanced. Competitive “open” bidding, as we know it today, has been a public sector best practice for the sourcing of construction services for many decades. 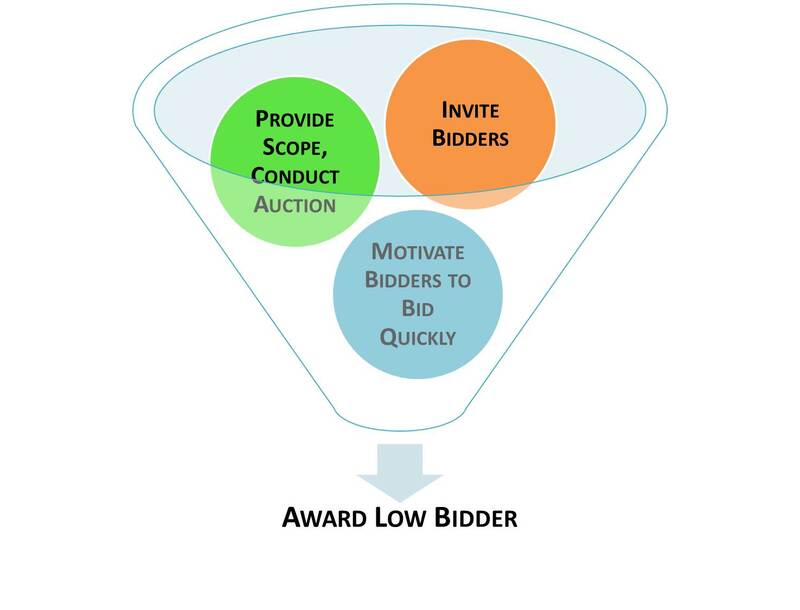 In the private sector, competitive bidding “by invitation only” is a widely held standard for project sourcing across all industries (Figure 1). THE EVOLUTION. Of course, innovators can’t leave well enough alone because we, as humans, always strive to make things better. This is not to say just because something is modified, it improves. A good example is what is generically known as the reverse auction, or reverse bid-auction (Figure 2). The term ‘reverse auction’ most commonly refers to a specific type of auction process – also called procurement auction, e-auction, sourcing event, e-sourcing or eRA, eRFP, e-RFO, e-procurement, B2B Auction – used in government and private sector procurement. As an evolution in bidding that gained popularity in the late 90’s, reverse auction tools have produced good results for the procurement of materials. However, reverse auctions for construction services has not been so well received, partly because this system does not address certain nuances in construction which are important to the success of a construction project. 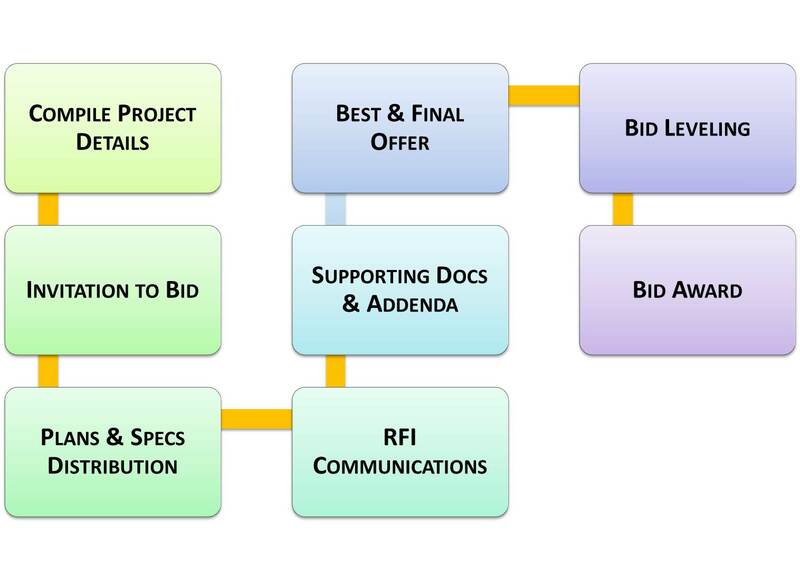 A very important aspect of construction bidding is the collaboration needed between the prime bidder and their sub/suppliers for pricing and scope clarifications during the bid phase. The typical reverse bid allows only 45 minutes from bid opening to bid close. While the clock ticks, the bidder watches as each lowest bid is posted to the bid room and s/he must rapidly drop their bid to stay in the running. There is no time for the bidder to work with their sub trades to prepare a responsible bid. The result is a frenzied process which often results in unrealistic drops in cost submissions. An experienced construction professional knows what comes next; a predicable increase in change order transactions during the construction phase. THE PAIN. Interestingly, our founder was a general contractor and he was first introduced to the reverse auction when competing for projects throughout the Midwestern US. It was this painful, frenzied experience that inspired him to create an alternative. Understanding that project owners will always want the lowest responsible price, the very first TotalBid product was Multistage Bidding. Our first customer was a fast food franchise that used Multistage Bidding to save tens of thousands of dollars on only a handful of projects per year. THE REVOLUTION. After 12 years of technology development, the TotalBid product suite now includes six (6) powerful products for bid management, and two (2) products designed for the construction phase. Multistage Bidding leads the way due to its combination of workflow automation, communications, and cost reduction benefits (Figure 3). If you have been following the growth and diversity of our company and its products, you have seen a wide variety of project types and sizes use Multistage Bidding as a best practice. Examples include hundreds of new, remodel and facilities projects, gas pipelines, energy infrastructure, big box retail, restaurants, bank locations, and the list goes on. Multistage Bidding is a proven way to streamline project sourcing, but also a technique to achieve measurable savings on every project. Multistage Bidding provides time for the bidders to make thoughtful, thorough bid submissions, unlike Ariba and Oracle and other reverse auction systems. Multistage Bidding is very similar to the traditional competitive bid process, but instead of one opportunity to win the project, bidders are provided two. By coupling two bid opportunities within a single bid event, a natural behavioral tendency is created, fostering greater competition. 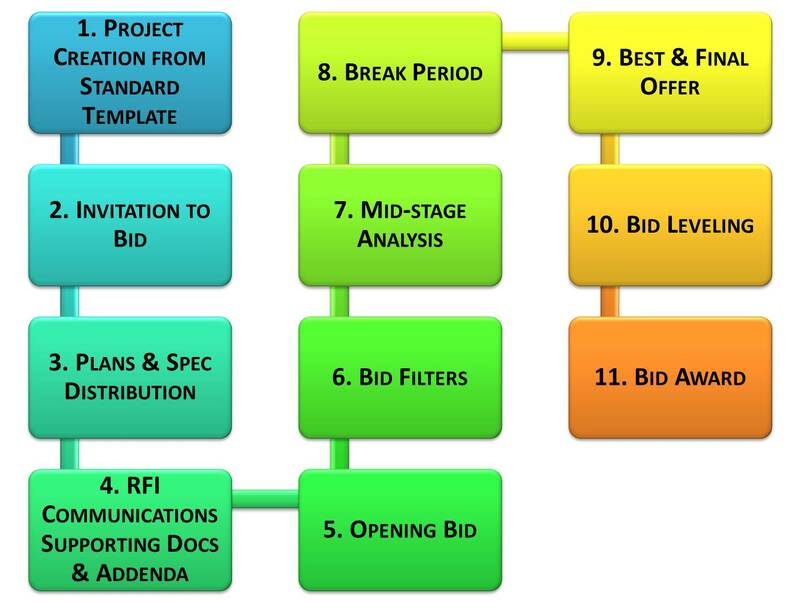 This is made possible with two standardized bid stages (Figure 3, #5-Opening Bid and #9-Best & Final Offer), thus the name Multistage Bidding. Although there are a number of ‘contractor display’ options defined by the project owner, the most popular process is where the low lump sum number is posted for all bidders to see. No other details are provided to the bidders. Then the bidders are granted the all important break period, typically 24 to 48 hours, to work on their revised bid. 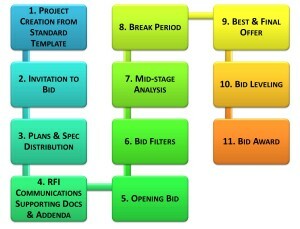 Bid Filters (Figure 3, # 6, and Figure 4, column 5) are a very important aspect of Multistage Bidding. They ensure the bidders make an aggressive attempt with their Opening Bid. The Bid Filter can be set for 3/5, meaning the low 3 bidders plus anyone within 5 percent of the #3 bidder advances to the Best & Final Offer. The Bid Filter is actually a robust “Smart Filter” that automatically adjusts to one less the bidder population, to foster a purely competitive environment if the number of bidders happens to be the same as the bid filter number. Mid-Stage Analysis (MSA) is another important control (see Figure 3, #7 and Figure 4, column 6). MSA is an option to the owner and enables the project manager to review and confirm scope compliance, and level the bids if required, before moving to the next stage in the process. MSA is not a requirement; some of our clients use it on every project yet others never use this product feature. The importance of the Break Period as already been emphasized. This is the time when the bidder is afforded the quality time to work with their subs and suppliers to resubmit a quality bid. Bid Leveling (see Figure 3, #10) is the final control measure when using Multistage Bidding. After the Best & Final Offer, Bid Leveling is an optional feature that also promotes scope compliance, similar to MSA. 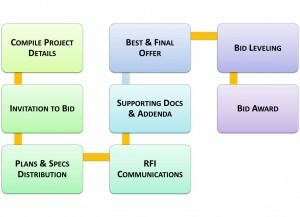 Bid Leveling is conducted at the end of the bid process to further level and clarify the bid submittals. CONCLUSIONS. Competitive bidding has traditionally been the best option for project sourcing initiatives. More recently, spend management / strategic sourcing systems have offered a reverse bid auction process that has worked well for commodities but not so well for the sourcing of services. CPBID Technologies, creator of TotalBid, has developed a process and method for automating the bid process but also optimizing savings. To date, the Multistage Bidding platform has been used for thousands of projects representing the energy, healthcare, financial, grocery, office, education, and retail industries, saving these clients millions of dollars every year. CPBID Technologies is a division of ContractPower LLC, and the creator of TotalBid, an industry standard and best practice for many project owners and contractors throughout North America. Well known program managers also use TotalBid to support their development goals and the goals of their clients. TotalBid has been recognized by the Federal Government, granting a patent for the unique and widespread Multistage Bidding system. Click on the About Us button to learn more.. Contact us today and start using TotalBid right away. Click here.